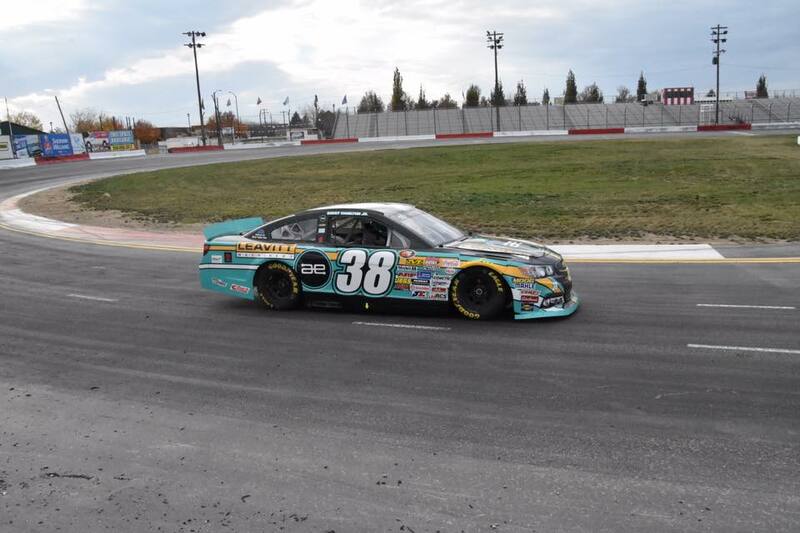 INDIANAPOLIS, INDIANA (November 3, 2017) – A diverse and exciting career will continue to grow for a third-generation driver, as 20 year-old Davey Hamilton, Jr. will drive the #38 Always Evolving/Leavitt Machinery Chevrolet SS in Saturday’s NASCAR K&N Pro Series, West at Kern County Raceway Park in Bakersfield, CA. The “West Coast Stock Car Hall of Fame Championship 150” will be Hamilton’s first NASCAR sanctioned start. Hamilton will drive for Idaho-based Patriot Motorsports Group and participated in testing at Meridian Speedway over the weekend in preparation for the event. The 2016 King of the Wing National Sprint Car Champion has competed primarily in Stadium Super Trucks, USAC Silver Crown, and BCRA pavement Midgets this year including starts in the Little 500 and at Phoenix International Raceway. The half-mile Kern County Raceway Park has been a good venue for the young driver with fourth place finishes in King of the Wing competition there in both 2015 and 2016. Hamilton will compete in the King of the Wing “George Snider Classic” on Sunday November 19th as well at the speedway in a busy month in Bakersfield. Always Evolving has supported Hamilton’s efforts throughout the season. Driving the Always Evolving Stadium Super Truck, Hamilton scored a sixth place finish; two seventh place finishes, and nearly won the series’ first trip to Beijing China in July. 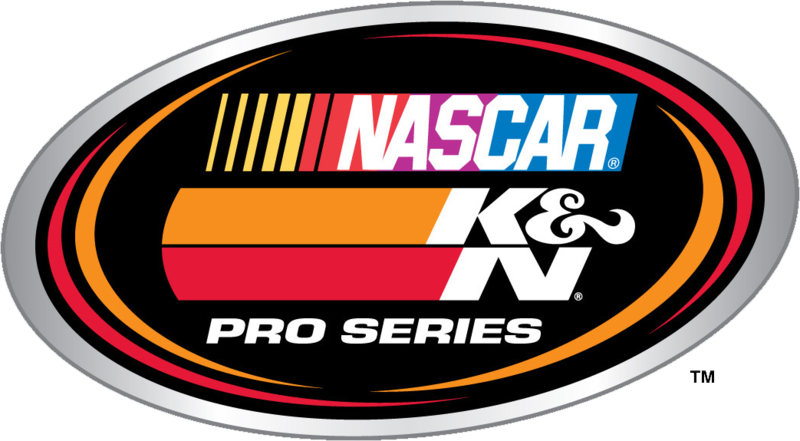 Not only is the event at Kern County Raceway the series finale for the NASCAR K&N Pro Series, West, it is televised on NBCSN with the broadcast set for Friday November 10th at 3:30 pm Eastern time. Davey Hamilton, Jr. will be available for media appearances throughout the week by contacting Steven Blakesley (916) 316-4854. About Always Evolving Motorsport: Based in Los Angeles, Always Evolving is an automotive lifestyle and motorsport brand with deep roots in entertainment. Born out of pure passion, and driven to give back, Always Evolving Motorsport has developed into a globally recognized brand. From movies and television, to racetracks around the world, Always Evolving continues to grow and expand its reach. Always Evolving Motorsport has participated in Pirelli World Challenge, Blancpain GT, IndyCar, NASCAR, Rally America, Formula Drift, Stadium Super Trucks, and the Australian Bathurst 12hr. DAYTONA BEACH, Fla. — The NASCAR K&N Pro Series West heads to Kern County Raceway Park in Bakersfield, California, for the final race of the season, the West Coast Stock Car Hall of Fame Championship 150 presented by NAPA Auto Parts on Saturday, November 4. Below is a look at the final race of the season and some of the selected participants. • Defending NASCAR K&N Pro Series West champion Todd Gilliland of Sherrills Ford, North Carolina, has an 11-point lead over Bill McAnally Racing teammate Chris Eggleston entering the finale. • The NASCAR Next driver can clinch his second consecutive championship by finishing seventh or better at Kern. • Michael Self has been the hottest driver in the series recently, having won each of the last two races on the schedule, including the most recent event at All-American Speedway. • Kern County opened in 2013 with a NASCAR Whelen All-American Series event. • The track held one K&N Pro Series West race each year since its opening, with the lone exception being the 2014 season, prior to this season. • Greg Pursley and Todd Gilliland are the only two repeat winners at Kern. • Todd Gilliland won in March at Kern. • This is the series’ seventh event at Kern. • Four different drivers have won at Kern, with Greg Pursley and Todd Gilliland winning twice. • Four different drivers have won the pole at Kern, led by two each for Greg Pursley and Todd Gilliland, and four times the race has been won from the pole. • Gilliland won at Kern in March, leading 72 laps after winning the pole for the second straight time at the track. 1-Lap Qualifying Record: Gray Gaulding, 17.908 seconds, 100.514 mph, Oct. 26, 2013. 150 Lap Race Record: Todd Gilliland, 66.905 mph (1 hour, 9 minutes, 57 seconds), March 2016. • Sits second in the overall West standings, 11 points behind leader Todd Gilliland, with four wins, 11 top fives and 13 top 10s in 13 races. • Has nine career K&N Pro Series West wins with 30 top fives and 35 top 10s in 44 career starts. • Is the only driver to finish in the top 10 in every race this season and has wins at Tucson (Ariz.) Speedway, California’s Orange Show Speedway, Colorado National Speedway and Washington’s Evergreen Speedway. • Finished fourth at Kern in March and has finished in the top five in all three of his career starts at the track. • Has six wins, 10 top fives and 12 top 10s in 13 races this season to lead the series standings. • Won at Oregon’s Douglas County Speedway in August for his series-leading sixth win of the season. • Won four of the first five K&N Pro Series West races this season and owns 13 career K&N Pro Series West wins. • Won the first five pole awards of the season and four straight races — Kern, California’s Irwindale Event Center (twice) and Washington’s Spokane County Raceway. • Has won the pole and the race in each of his two career starts at Kern, including the race in March. • Finished second this season in the final K&N Pro Series East standings. • Sits third in the current West standings with eight top fives and nine top 10s through 13 races. • Leads the Sunoco Rookie of the Year standings by six points over Will Rodgers headed into this weekend’s finale. • Finished a career-best second at Kern in March and equaled the effort at Spokane and Colorado. • Won his first series career pole at Iowa Speedway, and finished fourth in the most recent event at California’s All American Speedway. • Sits seventh in the overall standings with one top five and seven top 10s in 13 starts this season. • Posted a season-high finish of fifth at Douglas County in August and enters the weekend with three straight top 10s. • Has one top 10 in two career starts at Kern, having finished 12th there in March. • Despite missing the season opener, is fifth in the standings with six top fives and 12 top 10s in 12 starts. • Has won each of the last two series races, at Idaho’s Meridian Speedway and All American, and now has eight career K&N West wins. • The win at Meridian was his first K&N Pro Series win since 2013. • Finished sixth at Kern in March, where he has one top five in two career starts. • Ranks a career-high sixth in the overall standings with two top fives and eight top 10s in 13 starts this season. • Finished fourth at Meridian, giving him six top 10s in the last eight races entering the season finale. • Won his only career race at Utah Motorsports Campus in 2008. • Finished 10th in March in his only career start at Kern. • Ranks fourth in the West standings with nine top fives and 11 top 10s in 13 races this year. • Competed in six races a year ago and is running for K&N West Rookie of the Year this season, where he trails Derek Kraus by six points with one race remaining. • Finished fifth in the most recent event at All American, giving him four straight top-five finishes and five in the last six races, entering the season finale. • Has two career K&N Pro Series wins, both in the NASCAR K&N Pro Series East, at New York’s Watkins Glen International and New Jersey Motorsports Park this season. • Finished third in March in his only career start at Kern. • Gilliland won at Iowa Speedway and Douglas County for his fifth and sixth wins of the season. • Eggleston won at Evergreen for his fourth win of the season. • Michael Self won at Meridian for his first win in the series since 2013 and then won the most recent event at All-American. DAYTONA BEACH, Fla. — The NASCAR K&N Pro Series West concludes its 2017 season, and the battle for the championship, with the West Coast Stock Car Hall of Fame Championship 150 presented by NAPA Auto Parts on Saturday, November 4, at Kern County Raceway Park in Bakersfield, California. Defending champion Todd Gilliland and his Bill McAnally Racing teammate Chris Eggleston have accounted for wins in 10 of the 13 races to date this season, with Gilliland holding an 11-point lead over Eggleston heading into the final race of the year. Gilliland can win his second consecutive championship by finishing seventh or better at Kern, regardless of where Eggleston finishes. Eggleston, the 2015 K&N Pro Series West champion, has four wins this season and is the only driver to finish in the top 10 in all 13 races to date. Gilliland, meanwhile, has six wins and has finished on the podium an impressive 10 times this year. AIRDATE: NBCSN, Friday, Nov. 10 at 3:30 p.m. EVENT SCHEDULE: Saturday, November 4 — Garage opens: 10:30 a.m.; Practice: 12:30-1:15 p.m.; Final practice: 1:30-2:15 p.m.; Group qualifying: 4:30 p.m.; Driver autograph session: 6:15 p.m.; West Coast Stock Car Hall of Fame Championship 150 presented by NAPA Auto Parts: 8 p.m.
NASCAR IMC CONTACT: Brooke Franceschini, (386) 631-6142), bfranceschini@nascar.com. 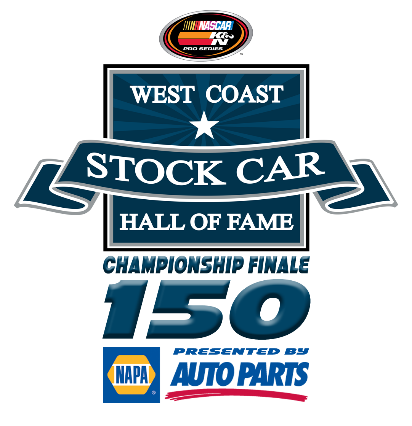 The Race: The West Coast Stock Car Hall of Fame Championship 150 presented by NAPA Auto Parts will be the final race of the 2017 NASCAR K&N Pro Series West season. The Procedure: The starting field is 26 cars, including provisionals. The first 22 cars will secure starting positions based on the group qualifying process. The remaining four spots will be awarded through the provisional process. The race will be 150 laps (75 miles) with a five-minute break occurring at or near the conclusion of lap 75. The Track: Kern County Raceway Park sits on 120 acres and opened on May 18, 2013 with a NASCAR Whelen All-American Series event. It’s a half-mile oval with progressive banking of 12 to 14 degrees in turns and eight degrees on the front and backstretches. The facility also hosts a dirt track and a Moto-X layout. Race Winners: There have been four different winners in the six previous K&N Pro Series West races at Kern. Todd Gilliland and Greg Pursley are the only repeat winners at the track, with Pursley having won the first two races held there and Gilliland having won the two most recent events at the track, including one earlier this season. Track Records: There have been four different pole winners in the five previous races at Kern, with Greg Pursley winning two of them. Pursley holds the track qualifying record of 100.514 mph, set in the inaugural event in 2013. In March, Gilliland set the 150-lap race record of 66.905 mph (1 hour, 9 minutes, 57 seconds). Two Times: Kern is the only track the K&N Pro Series West visits twice this season on different dates. Todd Gilliland won from the pole at the track in March, while his closest championship pursuer, Chris Eggleston, finished fourth after starting on the outside of the front row. Their Bill McAnally Racing teammate Derek Kraus, who currently leads the Sunoco Rookie of the Year standings, finished second at Kern in March for his best career finish. A mark he equaled on two other occasions this summer (Washington’s Spokane County Raceway and Colorado National Speedway). The only other track to host the series twice this season was California’s Irwindale Event Center, which ran Twin 100s in March. Strong Finish: No driver enters the season finale with more momentum than Michael Self. Self, of Park City, Utah, has won each of the last two events on the schedule. He won the NAPA Auto Parts Idaho 208 for his first series win since 2013, following that effort with a dominating win from the pole in the NAPA Auto Parts 150 at California’s All American Speedway. After missing the season opener, Self has vaulted himself into the top five in the overall standings with his recent performances. Along with his two victories, he has six top fives and has finished in the top 10 in all 12 of his starts this season. Eastern Invaders: NASCAR K&N Pro Series East drivers Ronnie Bassett Jr. and Dillon Bassett are both entered in the West Coast Stock Car Hall of Fame Championship 150. Ronnie Bassett finished third in the K&N Pro Series East standings, with one win, eight top fives and 11 top 10s in 14 races. Statistically, it was the Winston-Salem, North Carolina, driver’s best season in the series. He has one career K&N Pro Series West start, finishing 10th at Arizona’s Phoenix International Raceway in 2015. Dillon Bassett finished eighth in the final K&N Pro Series East standings for his first series career points finish inside the top 10. He posted two top fives and seven top 10s in 14 races. Standings Battle: The battle for the NASCAR K&N Pro Series West championship isn’t the only one taking place in the standings at Kern. The third- through fifth-place drivers are separated by only four points, with Derek Kraus (486), Will Rodgers (484) and Self (482) all within sight of finishing in third. Kraus has a six-point lead over Rodgers in the Sunoco Rookie of the Year standings as both rookies try to finish 2017 with their first career K&N Pro Series West victory. As the winter months draw nearer, a frost begins to blanket the fields and the chill of the air begins to settle in as much of the country heads indoors. When the cold front hits, racers don't fret over the thought of old man winter, frigid temperatures and a frozen tundra of dirt tracks sitting idle. Instead, racers find another place to play. They've all pointed their compasses west to bring us the best of both worlds as the USAC AMSOIL National and CRA Sprint Cars meet head-to-head for bragging rights and the prestige of becoming a "Western World" champion. The season-long national AMSOIL National Sprint Car championship race has reached its final stretch, involving the drivers who've run one-two in the standings for much of the season. Ione, California's Justin Grant clings to a 29-point advantage over Chris Windom of Canton, Illinois with five western races remaining. 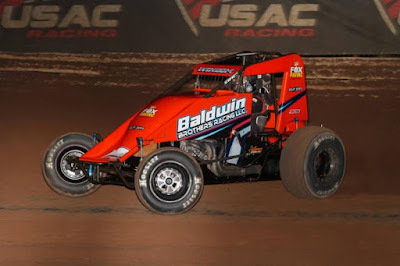 Grant's Western World marquee highlight dates to the 2015 season when he captured the victory on the opening night of the 360 portion of the program at USA Raceway in Tucson, interestingly enough, driving at the time for the Baldwin Brothers team that his nearest challenger Windom now occupies. Windom was simply dominant during the 2016 "Western World," leaving with a complete sweep of both nights of the National & CRA programs, while winning and finishing third in his two 360 outings. Though he stands a distant third in the National standings, Kevin Thomas, Jr. has been like Pacman lately, gobbling up points left and right in recent months. He's been victorious in three of the last five events, including the last two. He even got his Southwest trip started off on the right foot with a Southwest Sprint Car victory at Central Arizona Speedway last Saturday night. "Western World" USAC Sprint victor Dave Darland and Ford Motorsports as well as drivers Thomas Meseraull and Hunter Schuerenberg with Reinbold/Underwood Motorsports. To show how the west was won, these individuals will have to break through against a crop who intends to defend their home turf. 360 king R.J. Johnson, a 2010 "Western World" 360 winner out of Phoenix, Arizona, has become a force in the 410 ranks this season while maintaining his dominance in the Southwest division where he's all but locked up his fifth-straight series crown. Concord, California's Damion Gardner has a 101-point lead as he eyes his fifth consecutive CRA title and sixth overall. Last year, "The Demon" raced to back-to-back runner-up finishes behind Windom at the "Western World." Anaheim, California's Jake Swanson has already locked down USAC's West Coast Sprint Car title this season, but a first CRA title hangs in the balance as he sits second behind Gardner. Behind Swanson is the driver he dethroned in the West Coast series, Brody Roa of Garden Grove, California who himself is a 360 winner at the "Western World" in 2015 while two-time West Coast champ Danny Faria, Jr. takes over the reins of Midwest car owner Michael Dutcher's No. 17GP. The 50th annual "Western World" gets underway with an open practice night on Thursday night, November 2 followed by complete programs each night on November 3 & 4 for the National Sprints with CRA as well as the season finales for the Southwest Sprint Cars. An open practice night begins the festivities from 5:30pm to 8:30pm on Thursday. On Friday, pits open at 3pm, with the drivers meeting taking place at 4:30pm and cars on track at 5:25pm. On Saturday, pits open at 3pm, with an autograph session set for 4pm, a drivers meeting taking place at 5pm and cars on track at 5:25pm. Friday adult general admission tickets are $20, kids age 7-12 are $10, kids age 6 and under are $5 and pit passes are $35. Friday reserved tickets are $25, kids age 7-12 are $15, kids age 6 and under are $10 and pit passes are $35. Saturday adult general admission tickets are $25, kids age 7-12 are $10, kids age 6 and under are $5 and pit passes are $35. Friday reserved tickets are $30, kids age 7-12 are $15, kids age 6 and under are $10 and pit passes are $35. A package that includes tickets for both Friday and Saturday's events are $55 for adults, $25 for kids age 7-12, $20 for kids 6 and under and $75 for pit passes. Both nights of the "Western World" and all three nights of the "Oval Nationals" will be streamed LIVE on http://www.SpeedShiftTV.com/. PHOENIX (Oct. 30, 2017) – The West Coast Stock Car Hall of Fame annually applies the crowning achievement to careers in the motorsports industry. On Nov. 4, the group and NAPA AUTO PARTS, will boost the credentials of possible future inductees into one of the nation’s most prestigious halls of fame. The two groups are co-sponsors of the NASCAR K&N Pro Series West Coast Stock Car Hall of Fame Championship Finale 150, Presented by NAPA AUTO PARTS, at Kern County Raceway Park near Bakersfield, Calif. The 150-lap, 75-mile race will determine the champion of one of NASCAR’S oldest touring series. Racing begins at 7 p.m. (PDT) following a single-day schedule of practice and qualifying. The 14th event on the NASCAR K&N Pro Series West schedule marks the tour’s second visit to the half-mile paved oval in 2017. Current championship leader Todd Gilliland won the season’s second stop there in March as well as winning at Kern County Raceway Park last year. The NASCAR K&N Pro Series West dates to 1954 as a NASCAR-sanctioned tour, with its roots in post-World War II West Coast stock car racing. Twenty-two of its series champions are members of the West Coast Stock Car Hall of Fame, along with many decorated car owners, drivers, mechanics, officials, race promoters and media members. Bill McAnally, a West Coast Stock Car Hall of Fame member and owner of the NAPA AUTO PARTS-sponsored Toyotas of championship contenders Gilliland and Chris Eggleston, is pleased the company can be part of the event. “It’s great to have NAPA AUTO PARTS be involved in the championship race and the crowning of the 2017 champion,” said McAnally. The event serves as prelude to this month’s balloting among members of the West Coast Stock Car Hall of Fame to determine the organization’s Class of 2018. Two rounds of voting will select five inductees from an initial list of 20 nominees to be announced Nov. 12. The 15th Annual induction ceremonies, presented by Gateway Motorsports Park, will be held June 21, 2018 at the Meritage Hotel and Spa in Napa, Calif., kicking off the Monster Energy NASCAR Cup Series and K&N Pro Series West weekend at nearby Sonoma Raceway. A limited number of tickets will be make available to the public beginning April 1, 2018. Inquiries should be forwarded to jwentzel@phoenixraceway.com.